AndiMo’s is private but yet sociable. Think about that! There are only three rooms for rent and only two fishing points for two Anglers. 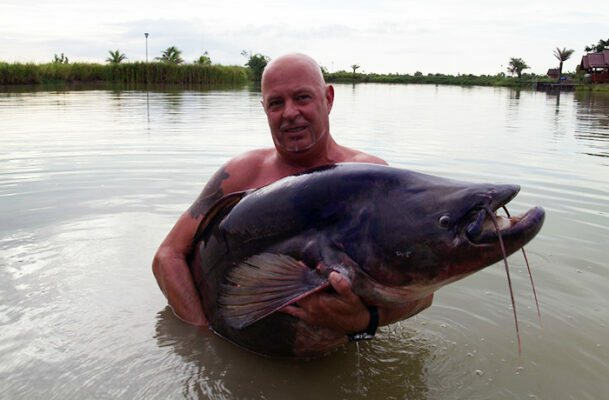 AndiMo´s Fishing Park offers a peaceful and beautiful rural setting where you can spend your time to relax while waiting for the big catch. Relax by the pool or on the house terrace. You can even enjoy a game on the pool table. Sit on the Terrace Bar and look out across the lake to deep green rice fields and palm groves as far as you can see. In fact, the resort is in such a perfect setting it suits anyone looking for the peace and tranquillity of the Thai countryside. Because the landscape is quite flat, there are spectacular sunsets for you to enjoy with cool refreshments available. For your physical well-being, they have a choice of international food and Thai food as well. Due to the fact that AndiMo’s only have a small number of guests, they can be flexible with food selection. If you stay a couple of days in the resort they will try to fulfil your every wish. 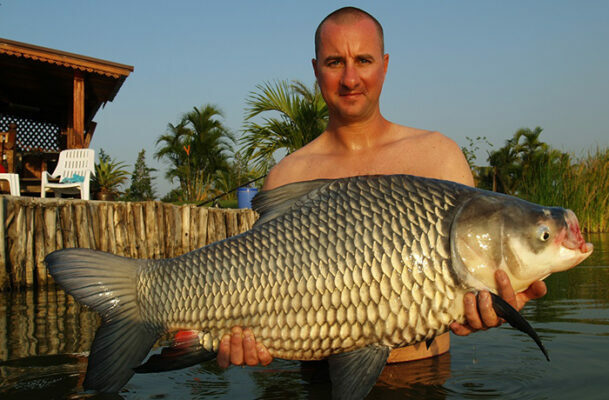 There are a number of different species of fish at AndiMo’s with fish weighing up to 100 kg. 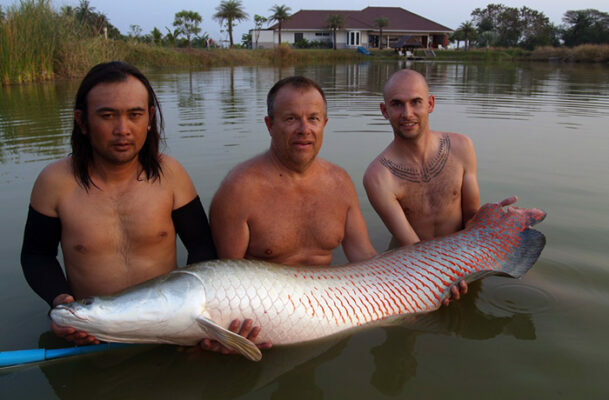 The larger fish are Mekong Catfish, Arapaima and Giant Siamese Carp and will pull your arm off. 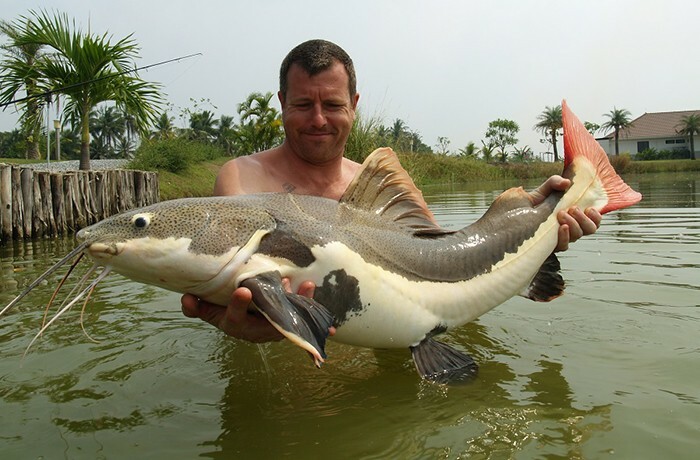 Other species swimming around are: Asian Redtail Catfish, Pacu, Common Carp, Alligator Gar, Amazon Redtail Catfish, Chao Phraya Catfish, Common Carp, Ripsaw Catfish, Tiger Catfish, Goonch Catfish, Wallago Leeri, Julians Golden Carp, Arowanna and Giant Goorami. AndiMo’s has 3 rooms for guests wishing to stay. There is a lovely Restaurant with fantastic views and good Thai & International food. A swimming pool is available to enjoy for all staying guests, as well as a bar and a pool table. Two rods, baits, guiding and electronic bite indicators incl. 2,300 THB per day/per person. Two rods, baits, guiding and electronic bite indicators incl. Non-staying guests are allowed to visit the dining and bar area. The use of the swimming pool and the sun beds are not allowed. 2,500 THB per day/per person.